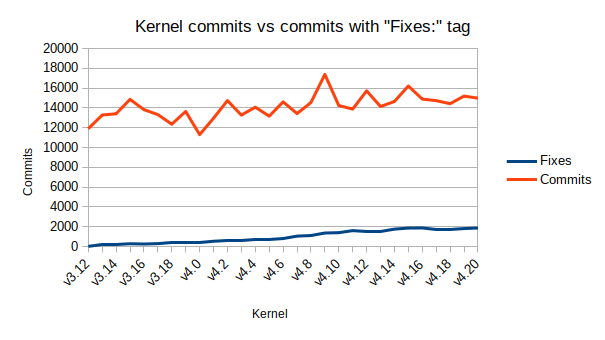 The red line shows the number of commits per release of the kernel, and the blue line shows the number of commits that contain a "Fixes" tag. 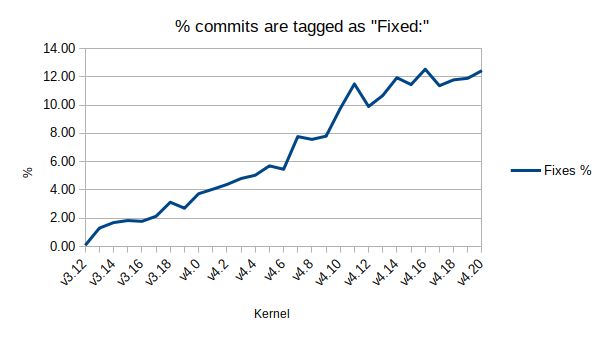 In terms of % of commits that contain the "Fixes" tag, one can see it has been steadily increasing since v3.12 and almost 12.5% of kernel commits in v4.20 are tagged this way. 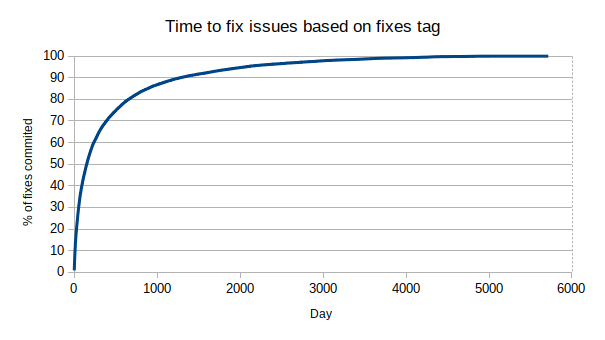 The fixes tag contains the commit SHA of the commit that was fixed, so one can look up the date of the fix and of the commit being fixed and determine the time taken to fix a bug. 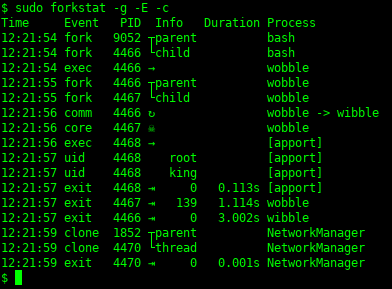 ..the modal point is at day 4, I suspect these are issues that get found quickly when commits land in linux-next and are found in early testing, integration builds and static analysis. 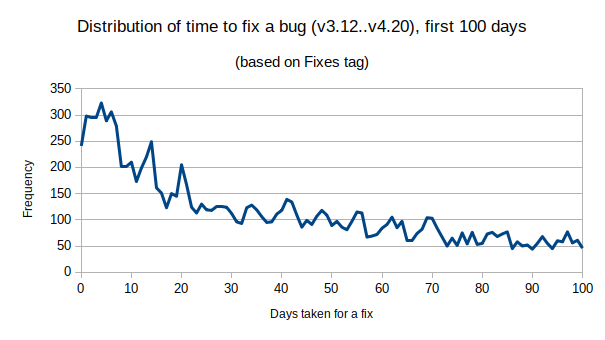 In the graph above, 50% of fixes are made within 151 days of the original commit, ~69% of fixes are made within a year of the original commit and ~82% of fixes are made within 2 years. 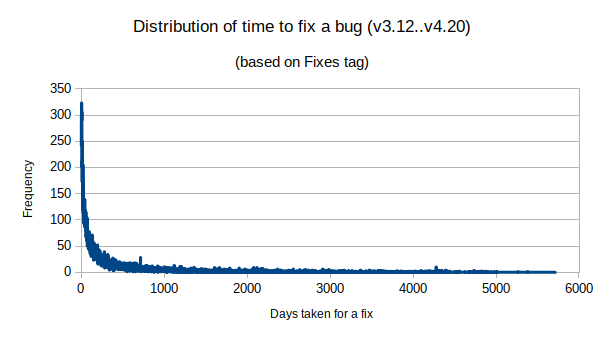 The long tail indicates that there are some bugs that take a while to be found and fixed, the final 10% of bugs take more than 3.5 years to be found and fixed. 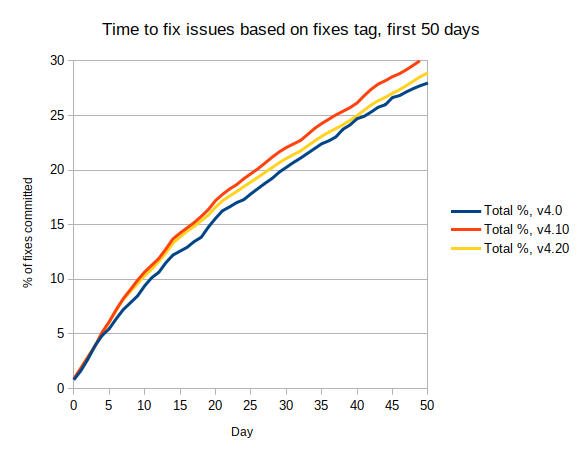 ... the trends are similar, however it is worth noting that more bugs are getting found and fixed a little faster in v4.10 and v4.20 than v4.0. It will be interesting to see how these trends develop over the next few years.